How to start our New Year’s weekend together? Somehow, I scored a Saturday off and I didn’t want to waste it in bed, so I set an alarm to get up. J woke up on her own about a half hour before I got up, so by the time I got up, she was ready to go get something to eat. I asked if we could wait a little while and just get lunch. When I told her I wanted to go to Chipotle, she didn’t object. 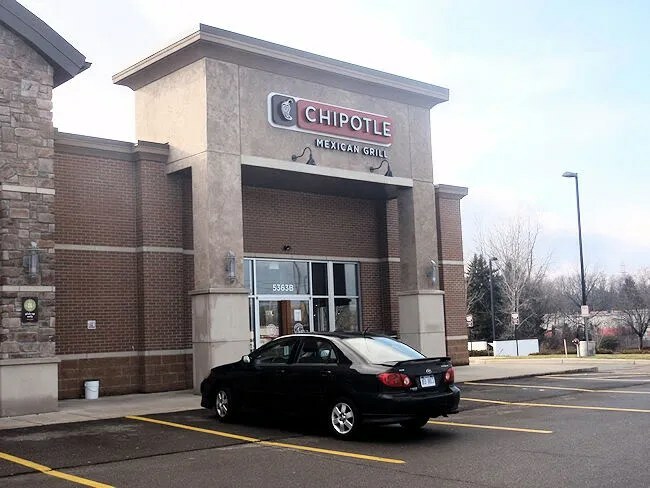 Kalamazoo finally got it’s first Chipotle when the Mexican chain moved in to the old Fire Bowl Cafe spot on West Main in November. Neither J or I had ever been to a Chipotle, but so many people were excited when they saw it was opening. I really had no expectations when we walked through the door to find what looked more like an upscale lounge than a taco joint. The seating situation was interesting. There were a couple long bars that had chairs that looked like little stools. There were a couple regular tables that slid into the space around the bars. We weaved our way to the back to order. The menu hanging above the order area is very vague. Since neither of us had ever eaten at a Chipotle, we really had no idea what to do. J took the lead and said she wanted two Chicken Tacos. The clerk said the tacos come in threes. That was fine with J. She was then given the choice of crunchy, flour or corn tortilla. She chose the flour which was then warmed up on a small taco press. 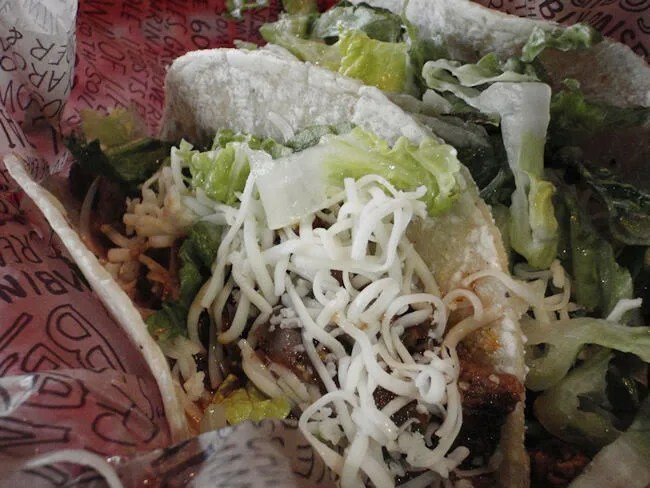 From there, they move the tortillas down the line where they’re topped. J chose lettuce, sour cream, cheese and the medium salsa to finish off her chicken tacos. I also stuck with tacos, but I got the steak on corn tortillas. I topped mine the same way J did minus the sour cream. 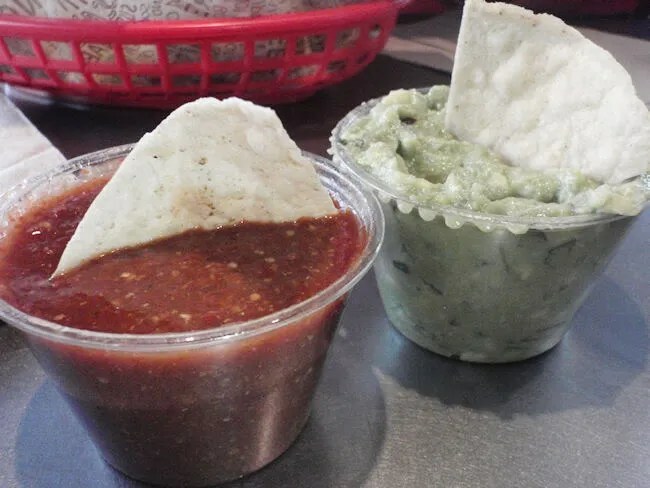 At the cash register, we added on a bag of chips with guacamole and some hot salsa as well as a couple drinks to bring the total to just a tad over $20. The food is served in plastic trays then it’s put on to a metal pizza pan instead of some kind of cheap plastic tray. I grabbed the saucer and headed to a seat at one of the regular tables. We both dug in to the tacos right away. Mine was delicious. There were some red onions mixed in with the steak, but had one not fallen out, I never would have noticed. The mild salsa on the tacos was pretty spicy and I’m glad I didn’t go for the hot. It would have been overwhelming. The corn tortillas were delicious. I love having that option. J seemed to be in agreement with her tacos, but three was almost too much. She only ate about two and half and felt like she was really forcing herself to do that. The chips and salsa/guac almost took a backseat because we both dove right in to the tacos. J said she appreciated the fact that they weren’t super salty. The hot salsa was, indeed, very hot. It had a really smokey taste to it which made me want to keep eating it, but I went through three Sprite’s just eating the salsa. The guac was for J as I’m not really a fan of guac in general. She ate about half it, but, like I said, the tacos were enough to make her leave stuffed. 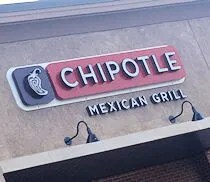 Chipotle is definitely a great addition to the chain restaurants scene in Kalamazoo. We were both really happy with our meals after we figured out the whole “what’s on the menu” thing we sort of had a problem with in the beginning. It’s another one of those places that is close enough to home that we will throw in to the rotation once the baby is born and we aren’t able to go out to a bar at the drop of a hat like we’re used to.